Unlike many conceptual artists of the 70s who reacted against the doctrine of formal abstraction, Ken Unsworth extended it by reincorporating human emotions into the arrangement of form and space. In his early sculptures of suspended or propped rocks, Unsworth enhanced such concerns through the use and control of the forces of gravity. The tension produced by supporting an inherently heavy material with thin wire or wooden sticks added a theatrical element akin to viewing a tightrope walker or balancing acrobat. his work with suspended and propped rocks: when the curtains opened, they revealed Unsworth suspended upside down from a pole, or in another setting he was suspended by his neck from two vast beams. Each of these settings had a strongly sculptural quality even though they were ephemeral. The final 'burial piece' differed from the 'Five secular settings' in that it entailed both sound and a theatrical build-up of tension. Unsworth's body, standing inside a glass box, was slowly covered with sand while his heartbeat was monitored and amplified. The audience listened while he was fully covered, until the dramatic conclusion when an assistant smashed the glass box with a sledge-hammer and the sand poured out onto the ground. Unlike his other settings, this was not so much a formal sculptural pose but an action sequence and one that was set up to be theatrical in its effect. In his subsequent work, Unsworth developed and expanded two important elements of these early performances: first the idea of performance as installation, and second the use of theatrical lighting and sound including musical scores. In later works the installation itself became more important and Unsworth's own presence within the installation played a lesser role. 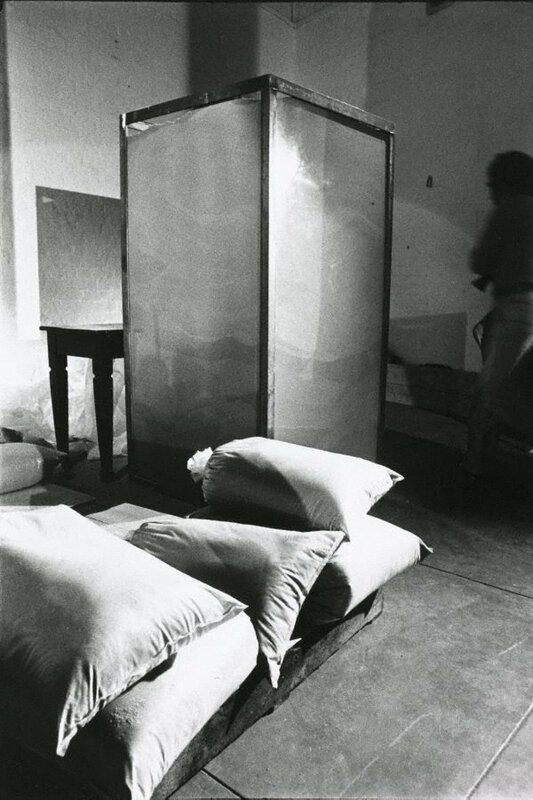 For the 1982 Biennale of Sydney, he exhibited 'Rhythms of childhood', an installation with light, sound and mechanical move-ment that included the ominous presence of himself sitting silently in the corner wearing a mask. In other installations, the performative element was played solely by mechanical elements combined with light and sound. Signed lower verso title page, ink "...Ken Unsworth...". Not dated.